As usual I went off for a walk this morning and instantly saw just the car to fit on the bows. You can see by the wheely bin next to it how big it is.Probably need a tug style boat to make it easier I guess. A short way down the cut is an overflow that turns the tow path into a ford. The fields alongside it, one on either side of the bridge, usually have stock in them. This one has three rather large Highland Cattle and while they are quite friendly I wouldn't like to be on the wrong side of the horns. The field on the other side has notices all along it. 'Please Note that any dogs caught worrying stock will be shot'. At least it says Please. There are plenty of dogs walking along here with few on a lead. You spend most of your walk with head down looking for the crap left behind. 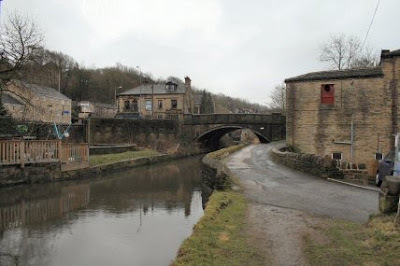 There is a discussion on at at the moment concerning the the surfacing of the Rochdale Canal towpath All I can say is that those against it don't do a lot of walking along it. It is a swamp and mostly mud. 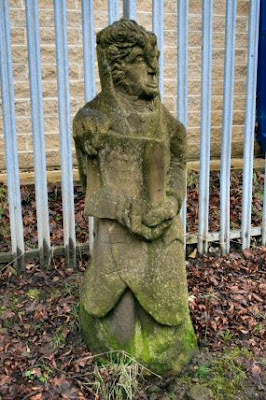 The railway runs just behind the site of the statue. 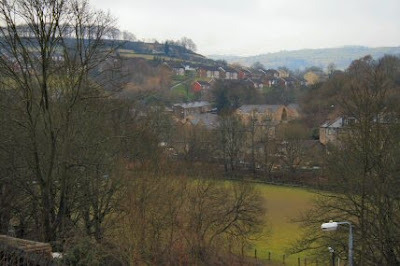 This looks as though it is the site of the Luddenden Foot station where Bramwell was once Booking Clerk. 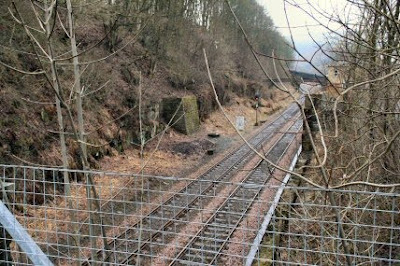 All that is left are the two dents in the rock where the platforms would have been and the remains of what might have been a footbridge. 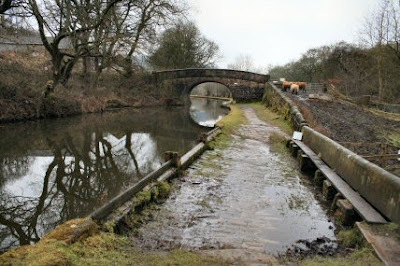 Most of the way up and a view looking back on the mooring and Luddenden Foot. The boats are moored the other side of the playing field. There is little in Luddenden Foot. A post office and shop, outdoor and camping shop and one pub. A quiet mooring. 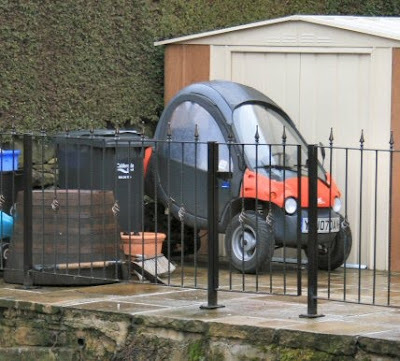 I saw one of these little cars hocked to the back of a large motor home in France. It was a bit tight backing out, so the driver unhitched it and pushed it like a wheelbarrow.